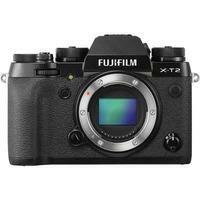 With improved autofocus and electronic viewfinder performance, the Fuji X-T2 mirrorless digital camera is an update to the popular Fuji X-T1, and is capable of shooting moving subjects under difficult conditions such as in wildlife or sport photography. It includes Fujifilm's sensor and image processing engine, colour-reproduction technology, and perfectly-sized ergonomic dials. For the first time in the X series, the X-T2 supports 4K video recording, and Film Simulation modes can be applied to both video and stills to add impact and depth. Featuring a large 0.77x viewfinder, premium image quality, outstanding operability, and a beautiful, traditional design, the dust and water resistant Fuji X-T2 is the ultimate mirrorless digital camera.